Yesterday I saw Michael Moore’s Capitalism: A Love Story. It was kind of discouraging. But not for the obvious reason. Right now I’m working on a piece for the magazine that has a different focus than Moore’s film but basically the same theme: the outrageous conduct of the financial industry over the past decade or so. But it turns out this is really hard to document. Surprisingly hard. There’s plenty of outrageousness to choose from, but most of it is either too dry (numbers, numbers, numbers), too complex to hit you in the gut (derivatives, Fed policy, etc. ), too distant from the real center of action, or too hidden to really get at effectively. Moore, it turns out, had the same problem. For example, there’s a segment early in the film about the Wilkes-Barre “Kids for Cash” case, where a local judge cozied up with a private juvenile detention facility and sent lots of kids there who hadn’t really done anything to merit being locked up. That’s outrageous! But it’s also garden variety fraud, not a serious slam against capitalism. Likewise, the segment on Detroit is heart wrenching, but frankly, not really a condemnation of either capitalism or Wall Street’s recent escapades. 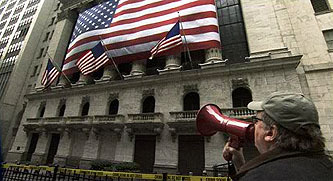 And when, toward the end of the film, Moore does turn his lens on Wall Street, he never really lands a killing blow. There’s a mishmash of public stunts (the “citizen’s arrest” gag), criticism of TARP and Goldman Sachs, some hits on the cult of deregulation, and a few other things, but they never quite add up. He’s obviously trying to make the point that the finance industry (and, more broadly, the rich) basically own Congress and everything else, but at least for me, it never quite came together. It was just too scattershot. And I really wanted it to come together. Because, as I said, that’s pretty much the theme of the piece I’m writing right now, and I’m having a helluva hard time with it. Like a lot of people, I believe pretty strongly that if the public really understood everything that had happened over the past decade, it would be torches and pitchforks time. But making the case is a lot harder than it sounds. Even Michael Moore, it turns out, had a pretty hard time with it.